Companies have always had to manage paper files. Initially, it was photocopies and faxes, more recently it’s Word documents and PDFs. In the digital era, however, there’s a much broader range of digital content enterprises must learn to control. As competition intensifies in a crowded digital marketplace, with disruptors new and old introducing changes to the rules almost daily, companies that fail to first recognize and address their inefficiencies around content access and control are standing on shaky ground. While the customer relationship management (CRM) software industry has been around for a few decades, it has been flourishing in recent years. According to Forbes, its growth is estimated to be 27 per cent year-over-year for Q4 2016. For 2017, experts predict the total market value will exceed $40 billion. A webinar poll that showed wide-ranging differences in the number of pieces of electronic content generated per customer engagement, did not surprise Klaren. Is information being harnessed to best result? When employees cannot find the information they are looking for, do they have the support they need to find that information? To Klaren, files should be seen in the context of an entire organization, not just as pieces of individual parts of an organization. Documents, he said, are the vehicles by which humans interact with each other, especially from one company to the next. Many businesses may be business- and process-focused, with data screens and analysis, but people work with each other through content. The management and control of this content, proliferating as it is in the digital era, requires more than CRM software. 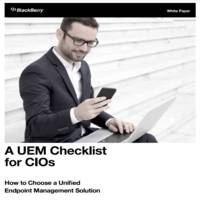 This is where enterprise content management (ECM), such as the one offered by OpenText, can help companies drastically reduce the amount of time employees spend searching for the content they need. Webinar host Jim Love touched on the fear being expressed by more and more companies that they are not getting all they can get out of their CRM. Klaren agrees with this assessment, focusing on the ease of use OpenText’s ECM solutions offer. To learn more about OpenText ECM solutions, visit the OpenText website.